Most people, if asked, would say they would prefer being rich to struggling financially. But, how many people actually think they’ll be wealthy in their lifetime? And what are they doing to make that belief a reality? To find out, GOBankingRates asked more than 500 Americans various questions about what it means to be “rich” in America. Keep reading to see their answers — and find out if you’re on the right track to living a richer life. In the survey, respondents were asked to rate their confidence in becoming rich someday on a scale of 1 to 5. Although 25 percent of people said they are “very confident” they will be rich one day, it seems that many respondents are not taking steps toward reaching that goal. When asked, “Of the following, which steps have you taken to achieve your definition of rich?” 26 percent of respondents admitted they have not taken any steps — whatever they might be. Meanwhile, 22 percent have focused on building relationships with friends and family, and 20 percent have paid off debt. Thirteen percent said they made savings goals more of a priority, and 11 percent are investing in order to try to reach their goal. Just 8 percent have increased their annual earnings in their quest to become rich. In the survey, more than one-third of all respondents said being rich is “being able to afford the life you want” — but 33 percent of these respondents aren’t doing what’s needed to afford the life they want. 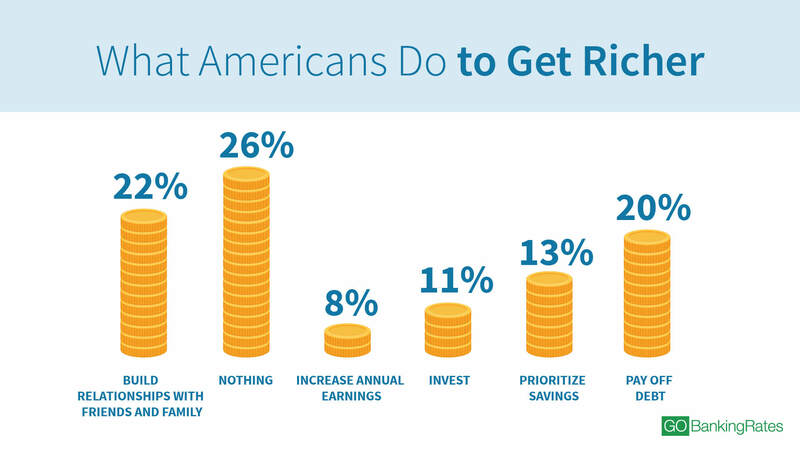 Recent GOBankingRates research sheds light on Americans’ struggle with building wealth. For example, a survey found that 58 percent of Americans have less than $1,000 in a savings account — and 26 percent have no savings at all. 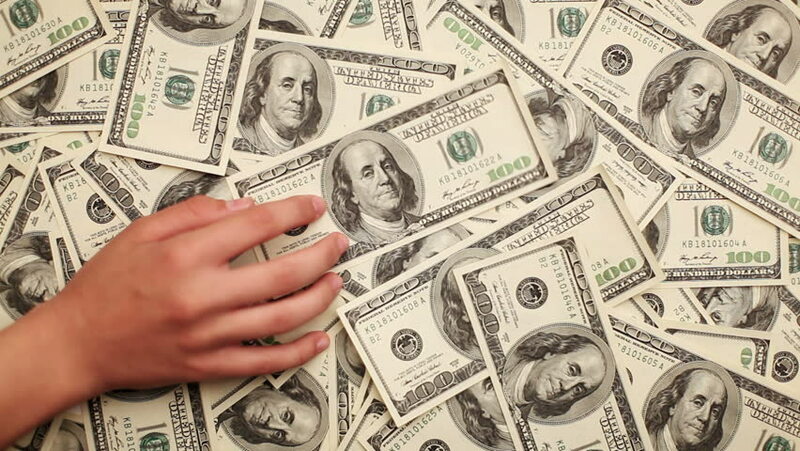 Furthermore, 42 percent of Americans have less than $10,000 in retirement savings. And, over 40 percent of Americans say they are not investing their money. It seems most Americans are not yet prepared to afford the life they want. But, there could be many reasons why people lack the savings and investments needed to build wealth. When it comes to investing, more than half of non-investors — 55 percent — said the primary reason they’re not investing is because they don’t have enough money, according to a separate GOBankingRates survey. And, when asked what would need to happen for them to start investing, 43 percent of respondents said they would also need to have less debt. Pay off credit card debt. If you have high-interest consumer debt such as credit card debt, make a plan to pay it off. Once you’ve eliminated those monthly debt payments, you’ll free up more money to set aside in savings or to invest in income-producing assets such as real estate. Make more money. Look for ways to increase your income by negotiating a raise or getting a second job. Then, invest the additional income. Control your spending. Resist the urge to spend on unnecessary items by asking yourself every time you make a purchase whether it will move you closer or farther away from your goal of being rich. Get help. Hire a financial planner to help you create a plan to make the most of your money. Paying off debt and saving money are important ways to build wealth, but a key component seems to be missing from most Americans’ plans to be rich. Investing was cited by just 11 percent of respondents. Putting your money to work for you — including tapping into the power of compound interest — is one of the the most effective ways to increase your wealth and eventually afford the life you want. Although many survey respondents aren’t taking the necessary steps to build wealth, it’s important to note that a good portion of respondents don’t think wealth is solely related to monetary gain. 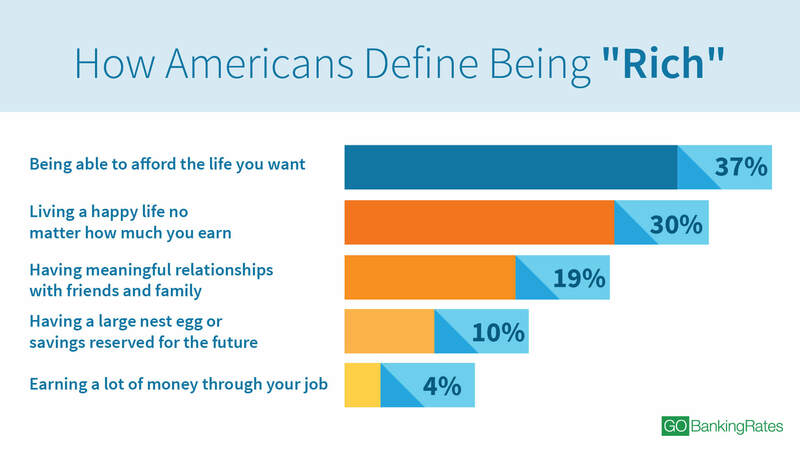 Nearly half of the survey respondents said that being “rich” isn’t about the money at all. Thirty percent said that you are rich if you “live a happy life no matter how much money you earn.” Nineteen percent said that being wealthy means “having meaningful relationships with friends and family.” The age group that most strongly feels this sentiment is the 45-to-54 age group, with 61 percent of respondents choosing these two answer choices. The age group least likely to choose either option was 25- to 34-year-olds. Women are also slightly more likely than men to say that being rich doesn’t relate to money, with 51 percent choosing these options versus only 46 percent of men. Sadly, 61 percent of all survey respondents do not currently consider themselves to be “rich,” according to their own definition of the term. However, that doesn’t have to be you. You can start today to take the steps you need to live a richer life.